Click to enjoy the German to English translation of Verklärte Nacht (Transfigured Night). Saturday’s concert was sponsored by James B. and Alden R. Murphy, in loving memory of her parents, Deever and Priscilla Rockwell. Thank you to Burnett’s Landscaping for sponsoring Sunday’s concert. 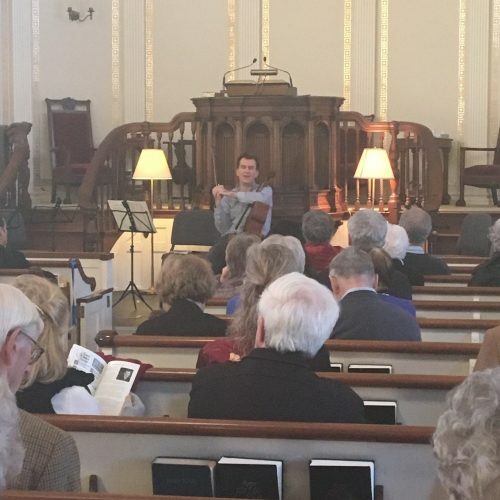 Two-time Grammy nominated violinist Jesse Mills enjoys performing music of many genres from classical to contemporary, as well as composed and improvised music of his own invention. Italian-born violist Ettore Causa is praised for his exceptional artistry, passionate intelligence and complete musicianship.